July 6, 2016 / Gail / Comments Off on Congrats Alli! 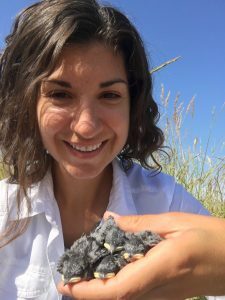 Allison Injaian was awarded an ARCS Fellowship for a second year, as well as a Student Research Award and Graduate Student Travel Award from the Animal Behavior Society (Thanks, ABS! ), and a Society for Integrative and Comparative Biology Student Grant in Aid of Research! Congrats, Alli! July 6, 2016 / Gail / Comments Off on Congratulations Cameron! Honorary lab member Cameron Jones was awarded the prestigious NSF Graduate Research Fellowship in spring 2016! Cameron is a graduate student in the Animal Behavior Graduate Group at UC Davis co-advised by Ann Hedrick and Andy Sih. Congrats, Cameron! July 6, 2016 / Gail / Comments Off on Congratulations Jenn! Jennifer Phillips successfully defended her PhD dissertation and graduated in spring 2016! Her dissertation is entitled What is Gloger’s Rule? Studies of the Relationships Among Climate, Coloration and Life History in Birds. Congrats, Dr. Phillips! August 11, 2015 / Gail / Comments Off on Congratulations Alli! Congrats to grad student Allison Injaian for receiving the 2015 ARCS scholarship! 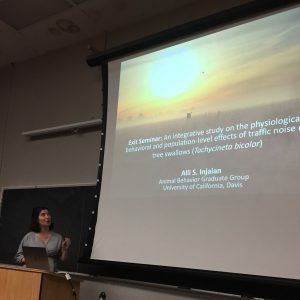 The ARCS (Achievement Rewards for College Scientists) scholarship provides a stipend to select graduate students in the STEM fields, with the goal of advancing science and technology worldwide. Lab member Jennifer Phillips was an ARCS fellow in 2013 and 2014. Congratulations to Alli also for receiving the UC Davis Graduate Studies Outstanding Graduate Student Teacher Award. This prestigious award recognizes teaching excellence on the UC Davis campus and is given to only a few stellar TAs from across campus each year. And finally, congrats on getting married this summer! December 15, 2014 / Gail / Comments Off on Congratulations Conor! 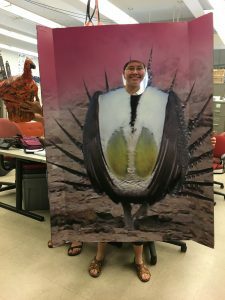 Conor Taff was awarded the Merton Love Award for Outstanding Dissertation in Ecology and Evolution at UC Davis, which goes to the student with the most outstanding PhD dissertation in the fields of ecology and evolutionary biology at UC Davis each year. Conor was also awarded the Cooper Ornithological Society Young Professional’s Award, which is given to two young scientists each year for outstanding research and contributions to the ornithological profession. To top off his winning streak, Conor was awarded the Animal Behavior Society Warder Clyde Allee Award for best paper and oral presentation by a finishing PhD student at the Animal Behavior Society meeting at Princeton University. These are all the top awards given to young scientists in their fields. Conor was awarded a PhD in Animal behavior in 2013 in the Patricelli Lab and is now a USDA postdoctoral fellow with Professor Andrea Townsend at UC Davis.